Reno in west Nevada is the third largest city in the state, and like Las Vegas has a downtown area featuring a collection of showy casinos, but away from here the city is no different to many others in the West, bordered by mountains on one side and high desert on the other. The city center is at the junction of 4th Street and old US 395, extending south to the Truckee River and north to I-80; beyond the river is the Midtown district, while the main site north of the interstate is University of Nevada, close to the start of open countryside. I-580 is the busiest route south, soon reaching Reno-Tahoe International Airport, served by a reasonable selection of hotels. Development continues another 6 miles east along I-80 across the adjoining city of Sparks, before the urban area stops abruptly at the edge of the Pah Rah Range. 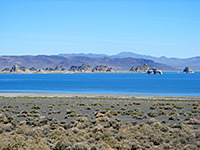 Two popular natural attractions nearby are Lake Tahoe to the south and Pyramid Lake to the north. The long established Siena Hotel (built 1958) rebranded as Renaissance Reno Downtown spring 2017, accompanied by a full renovation; the second hotel from this luxurious, stylish chain to open in Nevada, after a property in Las Vegas. The 214 hotel enjoys a prominent position in the city along Center Street, bordering the Truckeee River, also adjacent to the Pioneer Center for Performing Arts, and the National Automotive Museum. Reno International Airport is 3 miles away. Amenities include an all-day restaurant, bar, rooftop pool, and over 18,000 sq ft of meeting/event space. Guest rooms & suites have classic styling, accompanied by artistic touches, and are decorated in bright, welcoming colors. Right at the center of downtown Reno's casino district, Circus Circus offers every conceivable facility including comfortable, reasonably priced accommodation - there are 1,572 rooms & suites, most with elevated views across town and westwards towards the Sierra Nevada mountains. Hotel highlights are six main dining outlets, free live circus-theme shows, cabaret, 23,000 sq ft of meeting/convention space, and of course a large casino that offers a choice of over 60 table games, 1,200 slot machines, race & sports book, and many other attractions. Circus Circus occupies two blocks between 5th/6th and Virginia/West streets, a short distance south of I-80 exit 13. Newly constructed in 2016, Courtyard Reno has a quiet yet central location along 2nd Street overlooking the Truckee River, just across the road from the Greater Nevada Field baseball stadium. The casinos along Virginia Street are around half a mile away and the are plenty of nearby restaurants, bars and shops. Highlights of the 135 room, non-gaming and non-smoking hotel are the brightly decorated lobby with media board and comfortable seating, the Bistro restaurant (open for breakfast, dinner & evening drinks), an indoor/outdoor pool and a range of facilities for business & meetings. The Hampton Inn is the westernmost chain hotel in Reno, built beside Interstate 80 at the Robb Drive exit (8), with views of hills and mountains in most directions. Facilities in the vicinity include three restaurants, two gas stations, a bank and several shops, while on the premises are a convenience store, indoor pool, fitness & business centers and a 675 sq ft meeting room, catering for events of up to 60 people. Free hot breakfast is provided each morning. All guest rooms contain a coffee maker, work desk, refrigerator and microwave; there are also a selection of suites featuring a sofa bed and wet bar. The Hyatt Place has a somewhat exposed position at the Plumb Lane exit of US 395, surrounded by roads on all sides, not adjoining any other buildings, though it is about the closest hotel to the international airport, a quarter of a mile from the terminal. There are several shops and restaurants within walking distance, on the far side of the freeway. Wi-fi, hot breakfast and airport transportation are complimentary. Drinks, snacks and light meals can be purchased 24 hours a day from the onsite market. The hotel has an outdoor hot tub, indoor pool, business & fitness centers, and two meeting rooms. The recently built Holiday Inn Express Reno has a good location along the I-580 frontage road, a few blocks from the international airport and 2 miles south of the downtown area. Upper floor west facing rooms have a fine view over the Sierra Nevada Mountains around Lake Tahoe, while all are equipped with microwave, refrigerator, and some feature a whirlpool bath. Free hot breakfast buffet is served each morning, and for lunch & dinner the best choice of restaurants is half a mile west along Kietzke Lane. A indoor pool, hot tub, fitness center and business center are the other principal amenities. The SureStay Plus (Best Western) is the closest hotel to Reno-Tahoe International Airport - a large building (269 rooms on three floors), located directly opposite the main terminal, linked by complimentary, 24 hour shuttle. Accommodations are divided between four blocks that completely enclose extensive landscaped grounds with heated pool and hot tub; entry is through an atrium lobby that enjoys relaxing views over the gardens. The hotel also offers the full service, American-style Plaza Court Restaurant, a lounge/bar, fitness center, business center and extensive meeting space. Rooms contain a microwave & refrigerator; for extra space a selection of fireplace suites are available. The new Comfort Inn Airport hotel in Reno offers bright, clean rooms containing microwave & refrigerator, a free full breakfast, a fitness center, and a free local area shuttle that besides the international airport - just a quarter mile east - also reaches many of the nearby businesses, restaurants and casinos. The hotel is located along Plumb Lane, close to US 395/I-580 and next to a small shopping center with one restaurant; downtown Reno is an easy 2.5 mile drive away. The Quality Inn is a large hotel 1.5 miles south of downtown Reno, consisting of two units separated an outdoor pool, surrounded by plenty of parking space and close to major transport links; Reno-Tahoe International Airport is one mile to the south, I-395 (exit 66) is one block east, and the junction with I-80 is a short distance north. The hotel operates a free shuttle to the airport and the downtown area of Reno with all its casinos, and other amenities include complimentary breakfast, hot tub, guest laundry and some rooms with kitchenettes. Just south of the downtown area of Reno, the Quality Inn is located on the main road through town, US 395 (Virginia Street), in a commercial neighborhood but close to the relaxing waters of Virginia Lake Park. On the opposite corner of the highway intersection is the Park Lane Mall, and the hotel is easily reached from Reno airport and I-580, both a short distance east. The Quality Inn features an outdoor pool & hot tub, on-site restaurant (Taj Mahal) and a business center. All rooms have either a balcony or patio. Free hot breakfast buffet is prepared each morning. A few blocks east of the center of Reno along 6th Street, the Ramada Hotel/Casino is a high rise, full service property of 281 rooms, most with fantastic views of the city or the Sierra Nevada mountains. The hotel is easily reached from I-80 or I-580 and it occupies a spacious site, surrounded by ample free parking. On the south side is a sheltered outdoor pool, while inside, the many facilities include two restaurants, bars, a business center, meeting space for events of up to 500 people, games room and fitness center. A free shuttle is operated to Reno-Tahoe International Airport. Breakfast, wi-fi and a shuttle to Reno-Tahoe International Airport are some of the complimentary amenities of Baymont Inn Reno, a compact, four story, interior corridor hotel in a commercial neighborhood close to I-580 (accessed from the Mill Street exit),1.5 miles from the city center. There are several restaurants within walking distance along Kietzen Lane to the west, or in Grand Sierra Resort to the east, on the far side of the freeway. The hotel also offers a fitness center, outdoor pool and business center. Travelodge Reno is a typically low-priced motel with limited facilities, at the intersection of 7th Street and Virginia Street in the city center, one block from Circus Circus. Rooms are on four exterior corridor floors, and they feature free wi-fi and a coffee maker; a few hot tub suites are available. The standard free continental breakfast is provided. Accommodations are contained within three blocks looking out across the rather small parking lot. With 142 rooms, Motel 6 Reno is a larger than average motel, centered on an enclosed courtyard with outdoor pool, and located at the Wells Avenue exit of I-80, 0.3 miles from Reno Livestock Event Center. Downtown Reno is just one mile west, on the far side of the interstate, and the motel is also close to the University of Nevada. Rooms are basic, rates low and amenities restricted, to free coffee & local calls, guest laundry and wi-fi. On the corner of Virginia Street and Plumb Lane, the Motel 6 is a typical budget property offering basic, exterior corridor rooms and a limited range of facilities, in this case free coffee, guest laundry, wi-fi, a microwave/refrigerator in some rooms and an outdoor pool, which has a nice, partly tree-lined location at the rear, away from the main roads. An Asian restaurant shares the parking lot, and there are plenty more dining outlets nearby. The motel is 2 miles from both downtown Reno and the international airport. Motel 6 Reno West is the first chain hotel to welcome travelers arriving from California, along I-80; the pet friendly, exterior corridor property backs on to the interstate near exit 12 (Keystone Avenue), in a mostly residential district though near some restaurants and small shops. Rooms are in several connected blocks surrounded by the ample parking area, which has a small outdoor pool to one side. Wi-fi, microwaves and refrigerators are available, for a small fee. The motel provides free coffee and contains a coin-operated laundry.